Through pure co-incidence this match happened to the third time I had seen Huddersfield Town play within the space of ten weeks. Having caught them taking a severe bashing at Leeds, then witnessed their grim scoreless draw at Blackburn, I was not really holding out much hope for their chances this afternoon. Particularly so as I noted they had failed to win any of their previous four matches, and were hosting a Brentford side who, almost below most folks’ radar, had crept up to third place in The Championship. But in the event The Terriers deservedly came up trumps, surviving a few hairy moments towards the end. Only one Scot started this afternoon – former Falkirk defender Murray Wallace – but I was pleased to note Adam Hammill, whom I had admired during his short stay at my home town club Dunfermline Athletic, was named on the subs’ bench – I assume he was just returning from injury, for he did not feature. The opening salvos I felt saw Brentford well on top, their high-line pressing game causing Huddersfield all manner of problems – the visitors’ industrious duo of Alan Judge and Alex Pritchard in particular real thorns-in-the-flesh. And it took a really rather impressive stop by Town ‘keeper Alex Smithies from a deflected Judge effort to keep the score line blank during a decidedly rocky opening 15 minutes for the home side. But high-line pressing has its dangers, for it inevitably leaves spaces behind the defence for a well-delivered pass to exploit. And so it proved after 18 minutes play when the impressive Jacob Butterfield set Jack Robinson free down the Town left; the ball eventually reaching Sean SCANNELL to open the scoring. And it was another defence-splitting ball to Robinson, just after the break, which led to the home side going two-up. This time Scannell’s presence being enough to panic Brentford’s Jake BIDWELL into chesting the ball into his own net. Twenty minutes from time Jonathan DOUGLAS did pull one back for Brentford, and it took a couple more fine saves from Smithies to deny the visitors a draw. But it would have been an undeserved point, I feel. And I was left thinking: if Huddersfield can play as well as this, what are they doing down the bottom end of The Championship? Brentford's Jonathan Douglas has a dig but hits this one way over the top. Jonathan Douglas heads clear a second-half corner kick. Jonathan Douglas scores for Brentford. During the half-time break we listened to a relative of one Jane Khalaf relate the heart-breaking tale of her death and the family’s subsequent fight to persuade the German authorities to conduct a full investigation. Jane, a Huddersfield girl died in Cologne, it is believed subsequent to her drink being spiked with amphetamine. I would ask that you at the very least read her story and consider signing the web site appeal. It was, I felt, admirable that the football club (the girls’ parents were season ticket holders, I think) should give the family their opportunity to promote their cause, but the moment was tainted somewhat by the thoughtless actions of on-field announcer. Jane’s uncle had barely finished the family’s plea than it was dismissed by the announcer with a brusque “Tragic Stuff. On with the show as they say”, as he proceeded to begin reading out his list of birthday greetings before the family were even off the pitch. 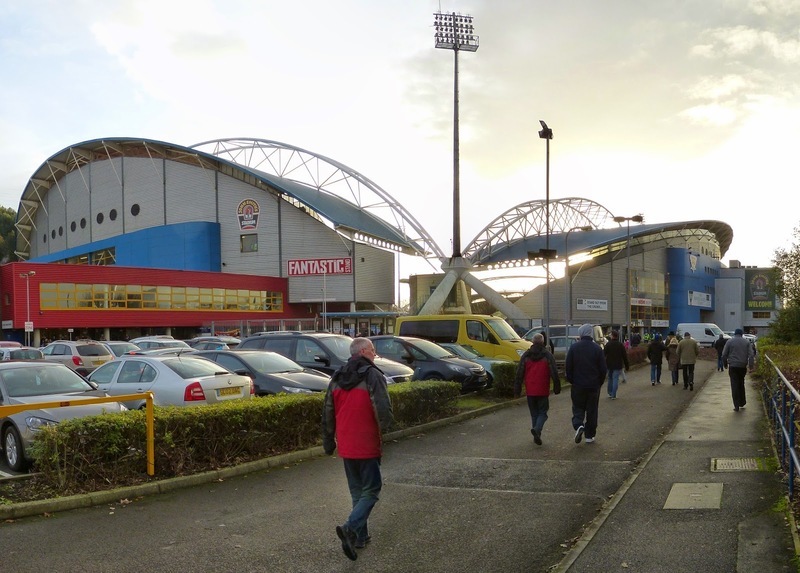 To end on a more positive note: what a great ground the John Smith’s Stadium is. There must be few more instantly identifiable stadia constructed in the last 20 years than this one. The sleek curved lines to the four stands, allied to the deep roofs seem to capture and amplify the din, retaining all atmosphere within. And if you are going to be resigned to having open corners, filling the spaces with those striking floodlight supports is the way to do it. I am guessing it probably some time since the ground has been completely filled for a football match. Indeed, has it even been? But I think I should really rather like to attend when some Big Lad visits. A definite return pencilled in. I think this is called The Fantastic Media Stand just now.